Lemon curd is easy to make, whether you use the traditional method or the microwave. I’ve provided recipes for both methods on this page, so pick your favorite, learn how to make lemon curd – and, the easy part, get some delicious ideas on how to use it. Lemon curd is a staple in many English households, and in recent years has become more popular across the pond as well. At Christmas, my mother always serves tarts on a three-layered serving plate, with raspberry tarts on the top, lemon curd around the center, and mincemeat tarts at the bottom. Yum! Use lemon curd as a filling for tarts or meringues, as a topping on ice cream or pound cake, or as a delicious spread between cake layers. It also makes a refreshing change from jam on toast, English muffins or scones. A jar of lemon curd would certainly make a great stand-alone jar gift, or a nice addition to gift baskets. Don’t forget to include a note with suggested uses for this delectable preserve. hown below) which includes suggested uses and the recipe for Easy Lemon Curd, or simply write your own. To use mine, print and cut out the tag, fold in half, then in half again, so that the pictured jar of lemon curd is on the outside, and the recipe and suggested uses are in the inside pages. Poke a hole in the top left corner, thread with thin elastic cord, and tie the little booklet to your gift jar. Fruit curds involve mixing beaten egg yolks, fruit juice, zest and sugar to a smooth, sweet consistency imbued with a tangy taste of citrus. Butter and egg whites are sometimes included the recipe. Unlike jams, however, fruit curds are not brought to a boil; this is to avoid curdling the egg and fruit mixture, and it means that lemon curd will not store as long as jam. For this reason, lemon curd is usually made in smaller quantities than jam, although refrigeration and modern preserving methods have increased storage time significantly from earlier times. 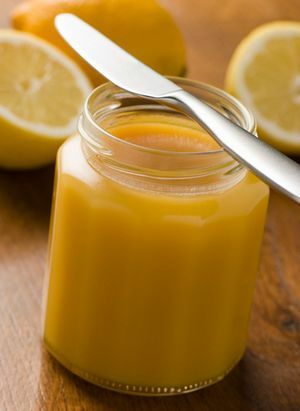 You’ll find more useful information on making lemon curd in this article, on Making Fruit Curds at Home. Wash lemons, and grate very thin strips of rind from the outside. Cut lemons in half and squeeze out juice. Remove any seed pips and set aside. Beat the eggs gently and mix in lemon rind and juice, butter, sugar and salt. Place in the top of a double boiler (a heatproof bowl placed over hot water will also work) and heat gently, stirring occasionally until the sugar has dissolved and mixture thickens. If curd seems too thin at this point, you may add another beaten egg yolk. Pour lemon curd into small sterilized jars and cover with sterilized lids. This recipe stores well in refrigerator for up to three months. Makes approximately two cups or one pint. Can be used as lemon meringue pie filling, or spoon over warm lemon or vanilla pound cake for dessert. 1. Grate the lemon rinds to produce two tablespoons of zest. Grate only the yellow zest, avoid the inner white pith which is bitter. 2. Extract the juice from the lemons to produce 1/2 cup (120ml) of juice. 3. Cut the butter into small chunks. 4. Put eggs, zest, sugar, and salt into cooled sauce pan. 5. Whisk ingredients in pan till frothy and light in color (a minute or two). 6. Add lemon juice and whisk 30 seconds. 8. Set pan on stove burner, turn on heat to medium-to-low, and start whisking contents so they don’t coagulate or stick to bottom of pan. 9. Whisk constantly till butter melts and mixture thickens, then whisk another two minutes, but do not let mixture boil – it should be quite steamy (185°F, 85°C). 10. Optional: Remove zest with the strainer over a mixing bowl and pouring the mixture through. Then work the mixture through the strainer with the spatula to strain out the zest and any egg lumps; rake mixture off bottom of strainer into bowl. 11. Pour mixture from bowl into jar to within 1/4 inch (0.75cm) from top, taking care not to get mixture on rim, then seal jar with lid. 12. Refrigerate to thicken the product further. although the sender says this is a popular seller at her craft bazaar. Mix lemon juice, grated peel, and sugar in a 2-qt. microwave-safe casserole. Add butter, cover with waxed paper and microwave on HIGH for 4-1/2 minutes, whisk, then microwave again for 30 seconds on HIGH, whisk again. Beat eggs until frothy and blend in about 1/2 cup of hot lemon mixture. Stir back into casserole and whisk well. Cover with waxed paper and microwave on MEDIUM for 2 minutes, whisk. Microwave on MEDIUM for another 2 minutes, whisk. Microwave on MEDIUM-LOW for 1 minute, whisk again. Microwave for 1 more minute on MEDIUM-LOW, whisk. The mixture should now be as thick as mayonnaise (if not, continue cooking on MEDIUM-LOW until it is). When lemon curd is done, whisk well and ladle into hot, sterilized half-pint (one cup) jars. Cover and cool to room temperature, then refrigerate. Makes 4 cups.